HIJAB BARBIE – Coming To A Store New You In April, Will It Have Instructions For Sharia Law? You know what’s missing from the children’s toys section at Walmart? A nice Barbie doll from the Allah collection! It would come complete with a hijab for every girl’s Barbie, you know, to make sure that they are modest. We don’t want to have to pop off the heads of these Barbies, because, you know…honor killings. Is it starting to sound ridiculous? Not according to Gisele Barreto Fetterman. Reports have it that Fetterman got the idea after she and her 5 year-old daughter went out on a “doll march” in Washington in commonality with January’s Women’s March. 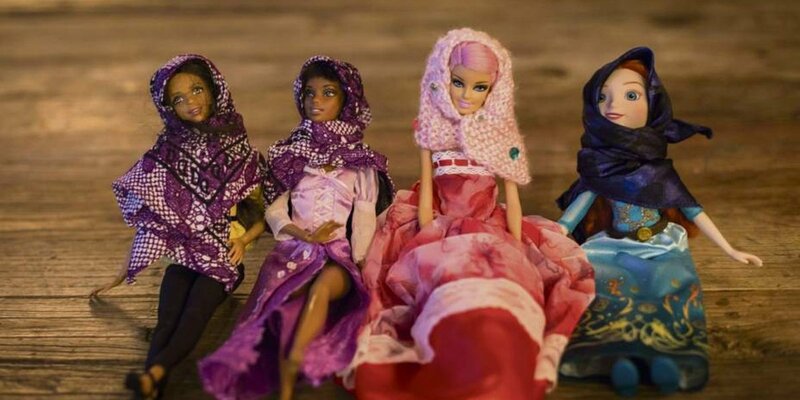 After Fetterman and a friend of hers who happens to be Muslim, Safaa Bokhari, couldn’t find any Muslim dolls that were available online, they decided to correct the situation by becoming entrepreneurs that cut small, colorful cloths that can be folded into little Barbie-sized hijabs. They named their product, “Hello Hijab,” and it’s hitting the shelves for purchase in April. Fetterman claims that the proceeds she receives will go to the ACLU, the Islamic Center of Pittsburgh and Community Blueprint Pittsburgh. …So, when is the new line of catholic Barbie going to come out, you know, with a crucifix around her neck? Oh! What about an orthodox Jew and his kippah?